For other schools with the same name, see Benedictine High School (disambiguation). Benedictine High School is a private, Roman Catholic, college preparatory high school for men, located in Cleveland, Ohio, United States. The school serves grades 9–12 and has an enrollment of over 425 young men for the 2015-2016 school year. It is a part of the Roman Catholic Diocese of Cleveland. Benedictine's sister school (female counterpart school with which it often shares transportation and extracurricular activities) is Beaumont School of Cleveland Heights. Benedictine High School was founded in 1927 by the Benedictine monks of Cleveland. The first location of the school was at East 51st Street and Superior Avenue in Cleveland. The original focus of the founders was to teach the sons of Slovakian immigrants. The school grew quickly and in 1929 it relocated to the site of St. Andrew Abbey at 10510 Buckeye Rd. In 1940, with even further enrollment expansion, the school moved to its current location at 2900 Martin Luther King, Jr. Drive. The 1950s saw more enrollment growth for the school and increased academic recognition. In the 1960s and 1970s, as the population in Cleveland shifted and the costs of Catholic education rose, school enrollment shrunk. However, at this time the school developed a focused college preparatory program, which resulted in over 96% of students going on to college. In the 1980s, to adjust to new circumstances, the school developed an extensive bus system. The system allowed for young men from all over the Cleveland area to attend Benedictine. The 1980s also brought about a capital campaign that sparked improvements in classrooms, and the building of a new church and bell tower. In 2009, the school launched a multi million campaign to create a multi-purpose field. The campaign was launched in order to honor three Benedictine legends - Coach Augie Bossu, Coach Joe Rufus, and Bishop (Abbot) Roger Gries O.S.B. This field hosts many sporting events, including football, lacrosse, soccer, as well as serving as host to summer sports camps and CYO events. To receive a diploma, students must earn 24 credits in college preparatory classes. Because of these and other academic guidelines, over 99% of graduates qualify for college. The average class size is 18 students. The school has an outstanding academic record, with recent graduates qualifying as National Merit semi finalists, a current Hesburgh Scholar at the University of Notre Dame, and as of 2014, the school boasted acceptance of at least one graduate into one or more of the U.S. military academies in sixteen of the last eighteen years. The school offers a selection of Advanced Placement courses, including AP English, AP Biology, AP European History, AP US History, AP Government, AP Chemistry, AP Psychology, and AP Calculus AB. The school has met with success in baseball, basketball, football, hockey, track & field, lacrosse, soccer & swimming. Benedictine (once a member of the Cleveland Senate Athletic League) spent more than three decades independent of any athletic conference affiliation, but joined the North Coast League in 2011. Benedictine's athletic rivals are Lake Catholic, St. Ignatius, St. Edward, and Walsh Jesuit. Benedictine recently added a men's lacrosse team which will compete in the OHSLA. Benedictine is the only school in Ohio to win an OHSAA State Championship in every decade since its inception. Benedictine has had several successful athletes represent the school at the state cross country meet. Benedictine has sent several athletes to the state meet in track & field events. Benedictine has sent many athletes to the state swim meet since 2011. They peaked at 20th of over 50 teams in 2012. Benedictine has over 400 students, with an average class size of 23 and a students-to-teacher ratio of 21/1. Nearly 100% of our graduates go on to college earning an average of over $5 million in scholarships, grants and financial aid overall. The Class of 2006 boasted five National Merit Scholars, $5.7 million earned and an impressive list of university selections including the University of Notre Dame, Northwestern University, Duquesne University and appointments at West Point and the Air Force Academy. The Class of 2007 also came in at nearly $6 million awarded in scholarship, grant and aid. 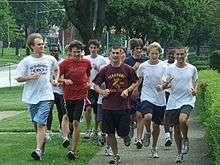 Activities for students include Academic Challenge, Art Club, Band (marching, concert, and jazz), Bennet (school newspaper), Brothers of Benedictine, Chess Club, Computer Club, Drama Club, Film Club, German Club, Investment Club, Italian Heritage, J.S.A. (Junior Statesmen of America), Junior Oblates, Key Club, Knights of the Altar, Latin Club, Literary Magazine (The Egoist), Magic Club, Marketing Club, National Honor Society, Pro-Life Club, Slovak Association, Speech and Debate, and Yearbook. Academic Challenge is a television game show in which high school teams answer questions to earn points and is broadcast on WEWS-TV. The team has appeared on the show each year from 2005 to 2008. In 2005 and 2008 the school captured the Academic Challenge title. Benedictine has three different official bands and one choir. They are the Marching Band, Concert Band, Jazz Band and the Men's Chorus. In addition, all freshmen are required to take Freshmen Chorus. Apart from the ensembles, Benedictine is home to a new state-of-the-art Music Technology Lab. This music lab houses 20 Workstations equipped with a Mac Computer, Midi Keyboard, Microphone and computer monitors all designed for student use of software, GarageBand, LogicPro and FruityLoops. The Benedictine Marching Band is smaller than most other high school bands in Northeast Ohio. The band goes to every varsity football game, and also marches in the Columbus Day Parade in Little Italy each October. At the end of each football season, the members of the marching band are expected to play in the school's Concert Band. In recent years, the marching band has grown from 19 members in 2010 to about 45 members in 2014. The music department is directed by Mr. Joshua Chenoweth. The Concert band plays two concerts each year; one at Christmas and one in the spring. The Concert Band also takes a trip with the remainder of the music department alternating years. Most recently the Concert Band traveled to Nashville along with the Jazz Band and Men's Chorus. The Benedictine Jazz Band includes all students enrolled in the "Jazz Band" class and others who join for concert occasions. It performs at concerts with the concert band, and at the annual Blue and White Gala, an annual charity event held by the school. The Benedictine Drama Club performs several productions each school year, with help from sister schools such as Beaumont School (Ohio). Recent performances include the Agatha Christie classic, And Then There Were None and 'Big River: The Adventures of Huckleberry Finn. The club is moderated by Father Timothy Buyansky OSB who has directed shows at Benedictine for over 40 years. The Benedictine Speech and Debate Team competes every Saturday, in the winter season, at high schools across northeast Ohio. The Benedictine Travel Club takes bi-annual trips to Luke Easter Park. The Bennet is published about eight times per year in four-page issues. The Bennet's traditional and current banner. Chuck Noll '49 - Head coach, Pittsburgh Steelers of the National Football League. Four time Super Bowl Champion. Terry Pluto '73 - Author and award-winning columnist for The Plain Dealer. He previously wrote for the Akron-Beacon Journal. Andrew Kaczynski '08 - Political reporter for CNN Politics. Larry Zelina '67 - only two-time MVP of the annual Charity Game, a Thanksgiving tradition, played at Cleveland Municipal Stadium. Helped Ohio State win the 1968 national championship as a sophomore starter that season. Was drafted by the Cleveland Browns in the 6th round in 1971. Wikimedia Commons has media related to Benedictine High School (Cleveland, Ohio). ↑ NCA-CASI. "NCA-Council on Accreditation and School Improvement". Archived from the original on 2010-03-15. Retrieved 2009-06-23. ↑ "Archived copy" (PDF). Archived from the original (PDF) on 2011-08-13. Retrieved 2011-06-12. ↑ Maxse, Joe (2011-09-09). "Whatever Happened To ... Tom Moriarty, former Benedictine and NFL football player". The Plain Dealer. Retrieved 2015-09-07.